Universal hand grip for DJI OSMO Pocket, for GoPro Hero 7/6/5/4, for SJCAM/ Xiaomi Yi and other Sports Cameras. 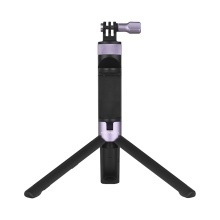 Durable aluminum & ABS material, can be used as a extend pole or as a mini desktop tripod stand. Rotatable top mount design, you can switch from selfie camera and POV easily by rotating the top mount in any direction. The adjustable phone holder allows you to use your phone as first-person view screen and change the angle depending on the shot. There is a 1/4 inch screw after removing action camera mount adapter, which enables you to install extra extension pole. The smartphone and camera showed in the picture are not included. It is required special camera holder to use your OSMO Pocket with this hand grip.